Add our best selling "America's Restaurant Recipes Volume 2" to your order and we will ship you both cookbooks (regularly $19.99 - you save $8)! 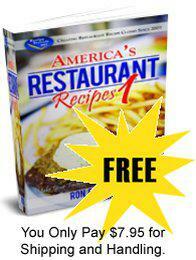 It has over 120 additional secret restaurant dishes with easy to follow recipes you can make at home. "Wow Ma, this is good..."
"These recipes are fantastic! So far I've made 5 different dishes using your cookbook and the response has been the same each time - 'Wow Ma, this is good. - Jocelyn Laurel, MD"
"I'm having the time of my life..."
"Just a short note to let you know that this has changed the eating habits of THIS household big time. I love to cook, but seldom took the time to fix anything very different. I am having the time of my life with the recipes that I find. - KC Mann"